Comptroller Willy Egbudin, Customs Area Controller, Nigeria Customs Service, Apapa Port Command, made the statement while addressing officials of the Maritime Reporters Association of Nigeria (MARAN) who visited him in his office on the state of cargo operations in the port. He maintained that dishonesty in the declaration by customs agents had been the bane of achieving 48 hours cargo clearance in the port, assuring port community of the commitment of the Service toward achieving 48 hours cargo clearance policy if honest declaration was done by customs agents. “We will achieve 48 hours if honest declaration is done by the trade community,” said he. The CAC said despite the low cargo traffic in the port at the beginning of the year, the command still made impressive performance in its revenue generation drive above the same period in year 2015. He said that the command generated a total sum of N24 billion in January 2016. “We are not doing badly in revenue generation, although there is low volume of import,” Egbudin said. He assured that more revenue will be generated by the command as import trade in the country improves, charging importers to desist from importing prohibited items. Answering question on the essence of pre-arrival assessment report (PAAR) in cargo declaration despite discrepancies being witnessed by the Service, Egbudin said importers were not being truthful with the information they provide in the PAAR as this contradicts the final documents submitted to Customs. He said PAAR was designed by the Service to help trade facilitation, and called on the media to educate members of trading community to adhere to import guidelines at all times. On the state of scanners, the CAC said only the fixed scanner was working, while the mobile one has stopped working, but assured that the Comptroller General had commenced procedure of procuring efficient scanners for the Service. The CAC said the fixed scanner working was underutilized, because of low cargo traffic. He also clarified that tariffs on vehicles were uniform, against opinions that all commands operated different duty regimes for vehicles. 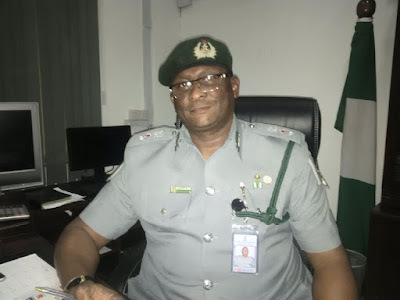 He advised intending vehicle importers to visit valuation unit of the Service to get correct duty before embarking on importation as this would allay any fear of being cheated and possibly make clearance fast. Speaking on the asset declaration, Egbudin said all officers in his command had fully complied with the directive of the Comptroller General, saying such exercise was not new.